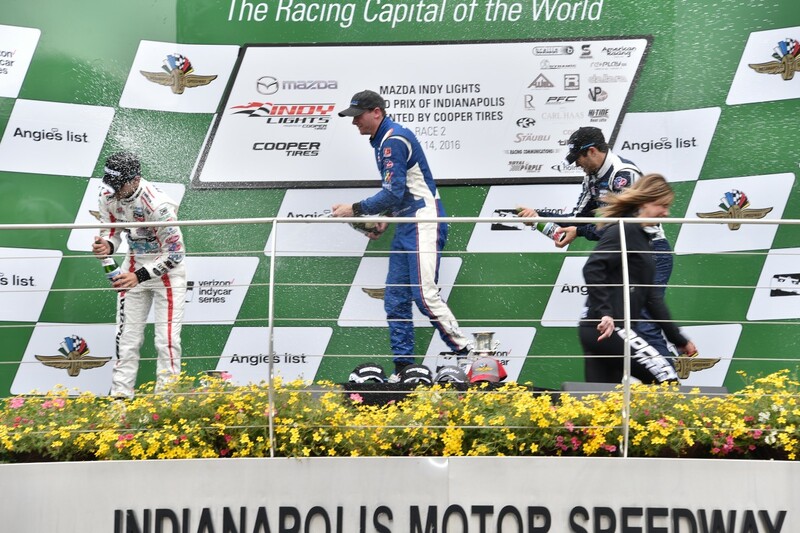 Mazda Grand Prix of Indianapolis Presented by Cooper Tires Indianapolis USA,13 &14 May 2016 Dean Stoneman romped home to his first win in the US with a flawless performance in the second of this weekend’s two Indy Lights races. Racing at the home of his Andretti Autosport team, the 25 year old was eager to build on his impressive 3rd place from the previous round at Barber and looking to put his marker down at the start of the famous month of May in Indianapolis which includes the Freedom 100 and World famous Indy 500. For race 1 on Friday Stoneman started from 7th , but as the race got underway he stunned those watching with a surge through the field up to second. Stonemam wasn’t content with ending his push there and was on a mission. He kept pressure on the lead driver for the next 29 laps until the safety car was deployed following an accident. When the racing resumed with just 4 laps remaining, Stoneman was part of a dramatic three-car battle for the lead which he managed to briefly grab before being forced out on the next corner with some questionable driving from Urrutia. Stoneman continued to driver superbly and keep the pressure on but was unable to make back places and finished once again on the podium in 3rd. Race 2 Saturday saw the 23 Stellrecht Mazda of Stoneman start from the third row in 5th. As the pace car went in a gaggle of leading cars entered turn one vying for the lead. Stoneman was looking racey and managed to make a move stick around the outside. With some of his championship rivals getting tangled up, Stoneman emerged in the lead by the end of lap one. What was to follow was a master class in car control and tyre management. The Southampton based driver came under pressure a number of times as both Urrutia and Serralles closed in on the Andretti driver in turn, but Stoneman had it all under control and when needed either forced a mistake from them or opened up a comfortable gap over each. This was a text book drive from the IndyLights Rookie who crossed the line, fists pumping, for his first win on US soil to establish himself firmly as a serious championship contender in the series. The result now moves him into 5th in the Indy Lights series. Dean’s next race will be the famous Indy oval for the Freedom 100 on Friday 27th May.